This page is written by the game's inventor, Jose Carrillo. This game is a favorite of its inventor. My 'Western' rendition of a Changgi board (above) and my Traditional Korean Chess set (below). It is widely accepted that Korean Chess derives from an old variety of Chinese Chess. 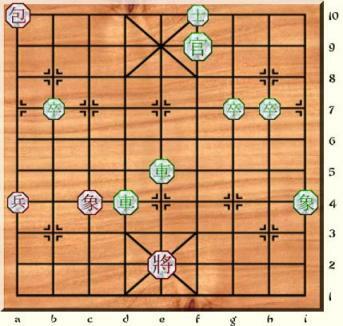 But in MY humble opinion (from my western point of view), Korean Chess (Changgi or Janggi) is actually an improved version of Chinese Chess (Xiangqi). Improved movement for the King (General) and the Guards within the Palace. A selective degree of randomness, as players are allowed to swap the places of the Knights and Elephants before their first turn. ... along with a couple of rule changes of my own, to complete my westernized random Korean Chess variation. The Pope in Rome has Swiss Guards; in Korean Random Chess (KRC), Kings are protected by powerful Samurai Guards inside their palaces, and also outside! KRC introduces Guards that can exit outside of their King's Palace and the Banzai tactic to the world of Oriental based chess variants. In addition to the Japanese Samurai and "Banzai" tactic, KRC also features Pawns that promote to any friendly piece (including Samurai Guards ) that has been captured, and for which they must be exchanged, upon reaching the 10th rank. This new rule was adopted in 2016. In my 'Western' rendition of a Changgi board above, for the Palace I'm using vynil strips (cut from a placemat just placed [not glued] on the board), Seirawan Elephants for the Elephants, Orthodox Bishops as the Samurai Guards, and homemade Cannons. For the Cannons I used drilled beheaded Rooks (I used the Rook tops to glue on Knights to make Chancellors). The initial position in the first row for the Rooks, Elephants and Knights is totally random, with the only restriction that you have one piece of each type at both sides of the King. There is direct symmetry accross the board for both armies. 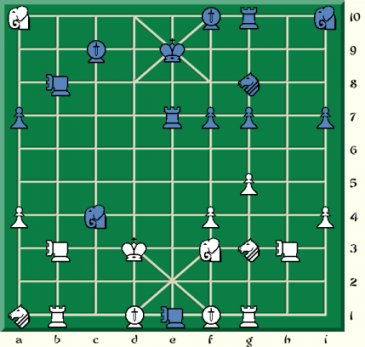 There are 36 possible random setups in Korean Random Chess. 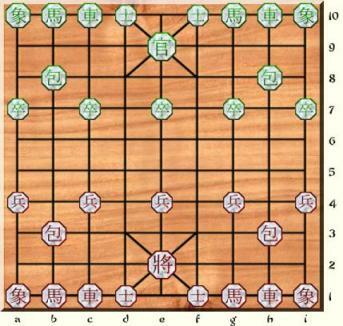 The initial position for the King, Samurai Guards, Pawns and Cannons is the same as in Korean Chess. The only purpose of the diagonal lines in the Palace is to show the Palace boundaries. For all purposes the Palace can be defined by a just marking the outside boundaries of the Palace (see the Cambaluc board below). 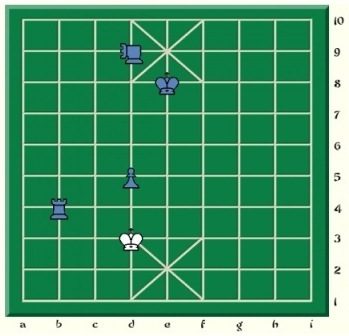 In Korean Random Chess the diagonal lines do not extend the movements of the Rook, Cannon or Pawns within the castle. Korean Random Chess can be played with a variety of character sets and boards. Remember that when using Chinese boards, the River must be ignored. Cannons [Po], Guards [Sa] and Elephants [Sang] keep their equivalent Korean names. Rooks, Cannons, Elephants, Knights and Pawns keep their traditional Korean movement; with the exception that Rooks, Cannons and Pawns can not move on the diagonal lines within the Palace (the lines in the Palace are meaningless with regard to piece movements). The Rook moves exactly the same as in Orthodox Chess. It moves in a straight line horizontally or vertically across any number of empty spaces, stopping either on an empty space or the first space it comes to that is occupied by one of the opponent's pieces. It may not pass over occupied spaces. The Knight first moves one space orthogonally followed by one more space diagonally outward. When the first space it would move over is occupied, its movement in that direction is blocked. The Elephant is like a giant Horse. It moves 3 positions away from itself: first by going one step horizontally or vertically and then TWO outward diagonal steps and there must be clear passage. Just like in Korean Chess, Cannons must jump a piece in order to move; but Cannons can not jump over Cannons, nor can they capture enemy Cannons. 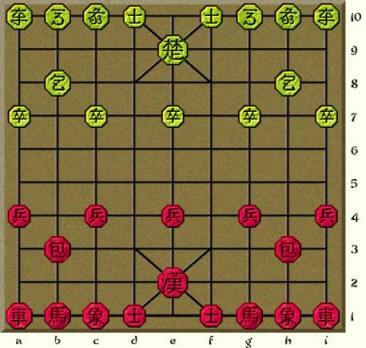 Therefore (unlike in Chinese Chess), a double Cannon lineup against a King poses no immediate threat, as the rear Cannon can't jump over the front Cannon. Pawns move the same way they capture: they can move either one step forward or one step sideways. They can never move backward. 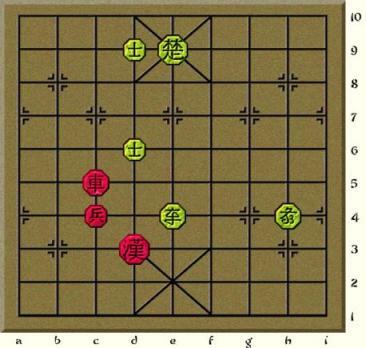 If a Pawn makes it to the last row, it must promote and be exchanged by a friendly piece (including Samurai Guards) that has been previously captured. This new pawn promotion rule is inspired by a similar rule from the Changgi Association Tokyo Branch. In the example above, the pawn at h10 promotes into a Rook. The King in Korean Random Chess moves just like an Orthodox Chess King, one step in any direction orthogonally or diagonally, regardless of whether there is a line or not showing the path within the Palace, which is different than in Korean Chess. Kings can not move outside of their Palaces. The two enemy Kings can NEVER face each other naked (without any pieces between them) on an open file at any time, just like in Chinese Chess. The traditional Korean Chess rule allowing Kings to place the other King in check in a desperate last-chance move to irreversably foresake the right to checkmate the other side (hoping for a stalemate) does NOT apply to Korean Random Chess. Korean Random Chess features Samurai Guards, which also move just like an Orthodox Chess King, one step in any direction orthogonally or diagonally (like a Courier Chess Man or Commoner). But a novelty in Korean Random Chess is that the Samurai Guards DO have the ability of getting out of the Palace. Therefore these Guards can be used both defensively (within the Palace) or offensively (outside of the Castle). The only catch is that when Samurai Guards are outside of the Palace, they must take (or kill) the enemy upon first contact (similar to how Checkers men are obliged to jump when possible and capture). Should a Samurai Guard be in contact with more than one enemy piece (i.e. fork), the player may choose which of the attacked pieces to capture. When a Samurai Guard is in a position where he must capture an opponent piece, the Guard is said to be in banzai. 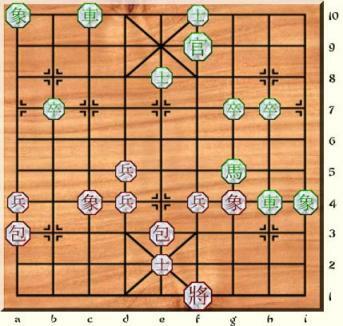 In the opening and early in the middlegame (when there are still lots of pieces on the board), players should keep their Samurai Guards in defensive outposts inside or close to the Palace, as offensive Samurai Guards in banzai must capture even if the capture will cause the suicide of the Guard or will weaken his army's own defense. Samurai Guards prove to be very powerful and efficient killers later on in the middlegame and endgame, when there are not too many pieces left on the board. 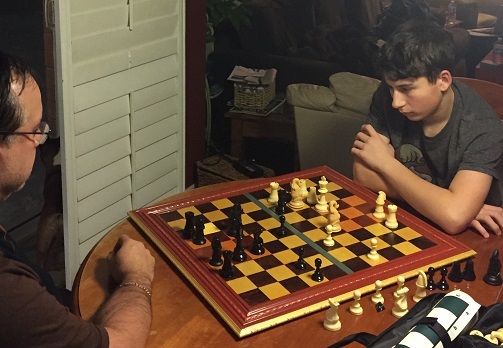 A Guard and his King will easily be able to checkmate an opponent lonely King. Samurai Guards are bound to the forced banzai attack rule when they are inside the opponent's palace. In this case the Guard's banzai capture may force him to come out of the opponent's palace. Similar to calling 'check', calling 'banzai' to remind an opponent he is in a must take situation is optional. But should a player in banzai miss the situation and attempt to move without capturing with the Samurai Guard, or move a different piece altogether, then his opponent must call banzai as a reminder to the first player that he must take with his Guard. It is possible for two friendly Samurai Guards to be in banzai at the same time. In this case the player chooses which Guard to execute the banzai attack with. If the other Guard is still in banzai in the next turn, then he will have to do a forced capture as well on that turn. It is possible for Samurai Guards to be in banzai for consecutive turns, which could prove deadly to the Guard early in the game. Players need to be well aware of the banzai tactic as the obligation to capture can be unfavorable to Samurai Guards outside their Palace. In some positions they may be forced by the enemy to capture to their disadvantage. Because of this risk, players should keep their Samurai Guards close to the Palace early in the game to avoid being forced into a banzai charge that may weaken their game. Note that the squares one step away from the castle (c1, c2, c3, c4, d4, e4, f4, g1, g2, g3, g4 for one side; and c7, c8, c9, c10, d7, e7, f7, g7, g8, g9, g10 for the other) are now vulnerable to an attack from a Samurai Guard inside (on the outside perimeter of) the Palace! Samurai Guards that have wondered outside of their own Palaces can return back inside. Once back inside their own Palace's, Guards no longer have the restriction that they must take upon close contact. Guard at f4: After Gf5, Red is forced to play Gxe6 or Gxf6 for his next move. Guard at f4: After Gg5, Red is forced to play Gxf6 for his next move. Guard at e6 is pinned (by the Red King): Green is not required to play Gxd7 or Gxf7, as this would put the Green King in check (by the Red King). Guard at e6 is pinned (by the Red King): Green may play Ge5. The Red Guard at f4 is now forced to play Gxe5, and now it would be the Red Guard at e5 the one pinned by the Green King. Guard at d1: Since the Guard is inside of the Palace, Red is not required to play Gxc1. Red though still has the option to capture with Gxc1 if he desires to. Guard at d1: Red can play Gc2 and fork both the Knight and the Elephant. Since the Guard is now outside of the palace, one of the two Green pieces will fall after Red's next forced move to capture (Gxc1 or Gxb3). Guard at d1: If Red plays Ge2 (this move by Red removes the pin on the Green e6-Guard), Green must now play Gxd7 or Gxf7 for his next move, as the Green King would now not be in check after his Guard's move. Guard at g9 is pinned (by the Red Rook at i9): Guard is not required to play Gxh10 as he would expose his King to check. Guard at g9 is pinned (by the Red Rook at i9): Guard may play Gf9 to get back into the Castle and get protection from his King. Green's Guard threatens to take the Red Elephant at c7, but since the Green King is in check, Green is obliged to get out of check first. Green actually played 27... Re9. Red played 28.Ef5 to protect his Elephant from the Guard and threaten the Green i3-Rook. Actually, Black sets up a trap! Black intends to play 25... bxb5 placing the Samurai Guard in banzai, forcing him to retake the b-Pawn, leaving the White Rook exposed to the Black Cannon's attack. 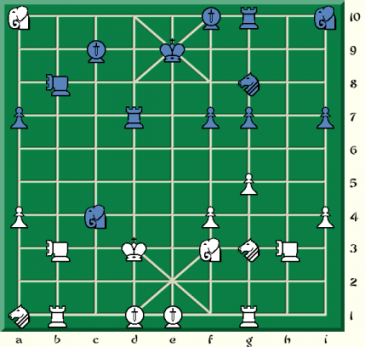 The position on the right above is after 25.Gd5? bc6! White's Samurai Guard avoids the 1st trap, but falls for a 2nd trap. The b-Pawn move places the d-Guard in banzai and creates a discovered attack for the Black Cannon on the White Rook. 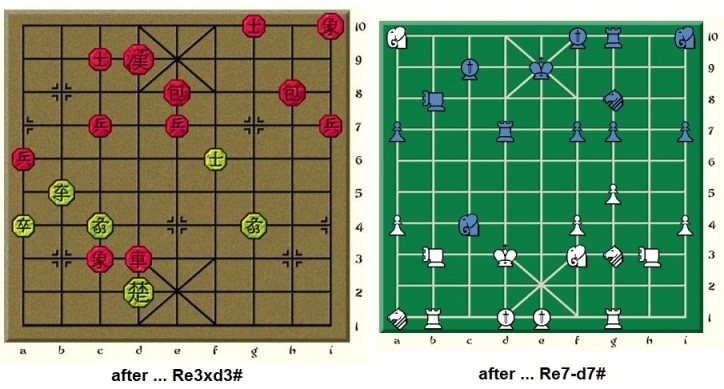 Now after 26.Gxc6 (banzai), ... Cxb2 wins the White Rook. Then on the 27th move, the White Guard will still be in banzai! It will be forced to do a suicidal banzai charge further deteriorating White's game, as after the forced Gxc7 or Gxd7, the Black Guard on c8 will be in banzai himself and will be required to take the White Guard's life. 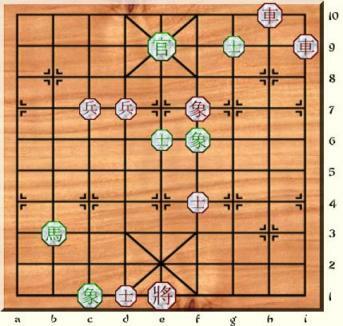 This position shows the risk of having Guards wondering outside of the Palace when there is still too many pieces on the board, as Guards may be forced to capture to their disadvantage. Traditional check and checkmate rules apply. The goal of the game is to checkmate or stalemate the opponent's King. 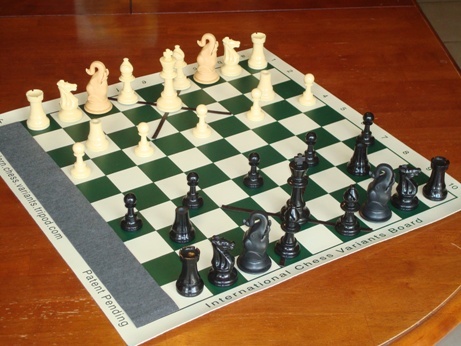 Stalemate is a loss for the side unable to move. Just like in Chinese Chess, the two Kings can NEVER face each other naked (without any pieces between them) on an open file at any time. Draws are discouraged. Most games in Korean Random Chess end in a win for one side. A player whose turn it is to move who has no move that does not worsen his/her position is in zugzwang, and he/she must play. Players are not allowed to pass in Korean Random Chess. 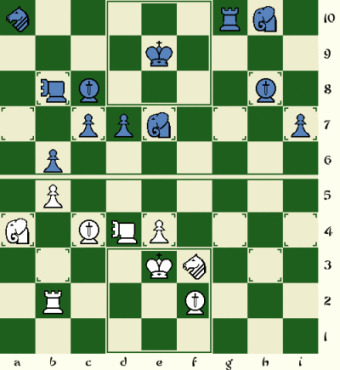 When a player is unable to legally move, but is not in check, the position is a stalemate and he/she loses the game. Games are only drawn by mutual agreement when neither side feels they can force a checkmate, after 50-consecutive-moves without a capture or a forward Pawn-move (sideways Pawn-moves do not reset the 50-move count), or by insufficient material. The only insufficient material situations that are automatic draws are lone King vs lone King, and lone King vs King & Cannons(1 or 2). Perpetual check is forbidden. You cannot check your opponent continually with the same piece (or pieces) repeating the same board positions over and over. You cannot force an enemy piece to move to and from the same two spaces, indefinitely. Korean Random Chess' Threefold Repetition rule: A player (the victim) who is being checked or whose pieces are being chased around can claim a WIN if the same position occurs three times, or will occur after their next move, with the same player to move. The repeated positions need not occur in succession. The purpose of the rules above is to avoid perpetual-move draws. The person forcing a perpetual move (the aggressor who is chasing a piece or giving the checks) must break off the repetitive sequence, or will risk losing the game by the KRC Threefold Repetition rule. White currently has a slight advantage and a more solid position. Should the Black Rook (the aggressor) have continued to chase the White Elephant (the victim) back and forth between a1 and c4, after: 29. ... Rc5 30.Eca1 Ra5?? 31.Eac4(3); White would have won the game by the KRC Threefold Repetition rule. Black played 29. ... Ege7 instead, to break the repetitive sequence and avoid a 3rd repetition of the postion above. 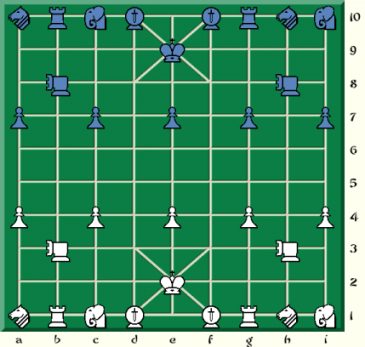 A King and any one piece (except a Cannon) are sufficient material to defeat a bare King (in the diagrams above imagine the position with the Kings with any one of the Red pieces on the board). 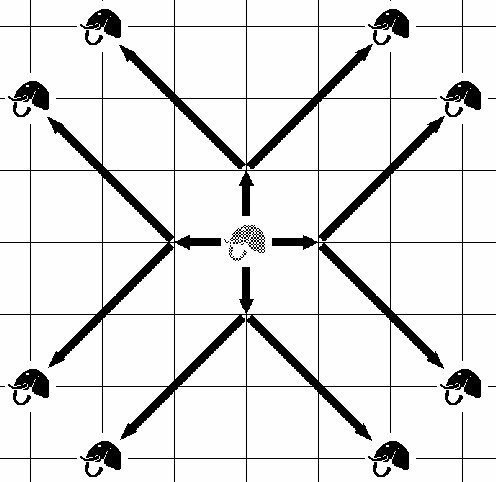 The King and a single Guard or Rook can checkmate (sample mates above left); while a King and Knight, Elephant or Pawn can win by stalemate (sample stalemates above right). A very powerful, often mortal attack! It's really a double check by Rook and Cannon, where the Cannon is backed up by the King (or another Rook). After the removal of the Cannon, when the Rook is then supported by the King (or another Rook), Triple Checks often prove to be very lethal! Left diagram after 9. ... Rd7-e7+++, a double check with the extra support from the King; diagram on right, two moves later after 10.Kd3 Ce8-e1!! 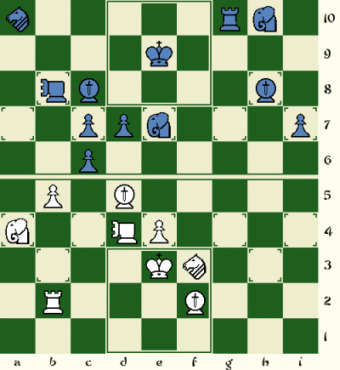 (the Cannon has a fork on both White Rooks) 11.Gfxe1 Rd7# checkmate! 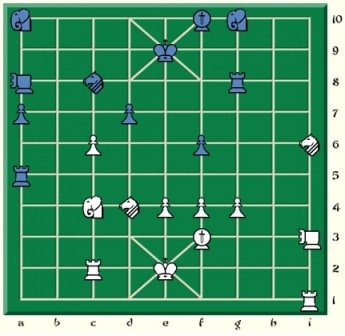 Look at the important role of the Black King in the final position, on the original file of the triple check. 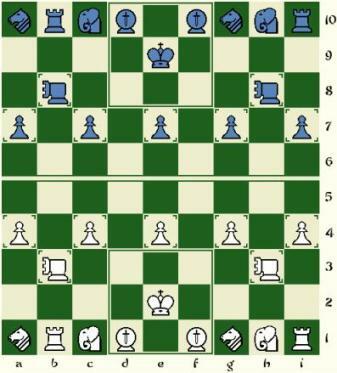 Left Position: Green wins. The Green Guard will hunt down the lonely Red Pawn, and then mate the Red King. 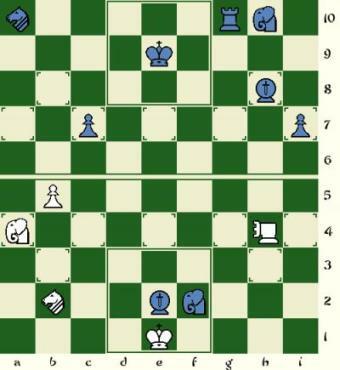 Left Position: Without the Green Guard at e10, this position can be agreed as a draw, as neither side will likely be able to checkmate the other (Pawns can't go backwards to attack eachother). Right Position: Red plays and wins. After Nxh6 Red will have no trouble mating the Green King. Right Position: Green plays and draws. With Ee8, Red will be forced to take the Elephant with the wondering d7-Guard, and after Kxe8, neither side will have enough material to mate. 2...Kf9 3.e7 Kf10 4.e8 stalemate, Red wins! 2...Ke10 3.e8 Kf9 4.e9+ Kf8 (or Kf10) 5.Ke3 stalemate, Red wins! Remember that at the start of the game the Rook, Knights and Elephants will be shuffled and placed randomly. Korean Random Chess (KRC) was created by Jose Manuel Carrillo-Muniz, from Puerto Rico in 2009.